"Beaching the fish” is a descriptive term that is often used in place of “Landing a Fish,” which means leading a fish into shallow water and gradually sliding it onto the bank. 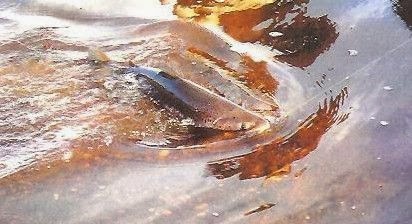 When landing a wild fish, you can use this method but you should keep the fish in shallow water until the release. Curiously, there is another unconventional method for beaching a fish that my dad used for landing steelhead on the North Fork of the Trask. It was one of those unprecedented flukes that we would never forget. We decided to fish the first hole above the falls because it was a natural place for steelhead to rest before continuing their migration up river. Most of the fish were wild and very close to the native strain. You didn’t just play these fish for a few minutes and then reel them in. It was an aggressive battle from start to finish, and quite often the fish dictated the outcome. They would literally tear up the water with powerful runs and spectacular head-shaking leaps. It was a fight to the finish and most of the time they won! The water was in perfect condition as we stepped in and began to cover it. I was just getting ready to make another cast when Dad yelled that he had one on. The fish quickly jumped several times and then tore downstream. Finally, he stopped its run and began working it back up river. The fish was at least 12 pounds and had plenty of fight left. Suddenly, it streaked across the water towards the other bank. Dad stopped it again, and as he looked around for a landing area the fish regained new strength. It streaked upriver, downriver and across to the other side jumping crazily out of control. Suddenly, the unthinkable happened. The fish made two more jumps and landed directly on the opposite bank and spit the hook out. We were stunned. However, the fight ended on a happy note when the fish quickly flopped back into the water. 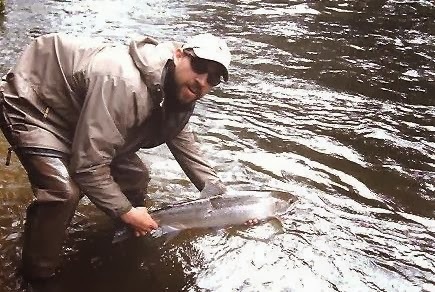 Summer Steelhead on a Goofus Bug?